Ladybug, an adult female guinea pig available for adoption. Peninsula Humane Society & SPCA celebrates Guinea Pig Appreciation Day by waiving adoption fees on guinea pigs for the week of July 16-22. In honor of Guinea Pig Appreciation Day, the Peninsula Humane Society & SPCA (PHS/SPCA) is waiving adoption fees on guinea pigs for the week of July 16-22. Guinea Pig Appreciation Day is celebrated throughout the world on July 16. Guinea pigs were once the most popular pets among royalty and the upper-class in Europe in the 16th century, and their popularity as pets has not waned through the centuries. Guinea pigs are interactive and bond quickly to humans. They can make great pets and require lower maintenance care compared to a dog or cat. Guinea pigs need hay, fresh water and vegetables and special food pellets formulated for them. They do require a large cage lined with pine or paper-based bedding. Guinea pigs on average live five to seven years and are known for their occasional unique squeals of delight and chattering. 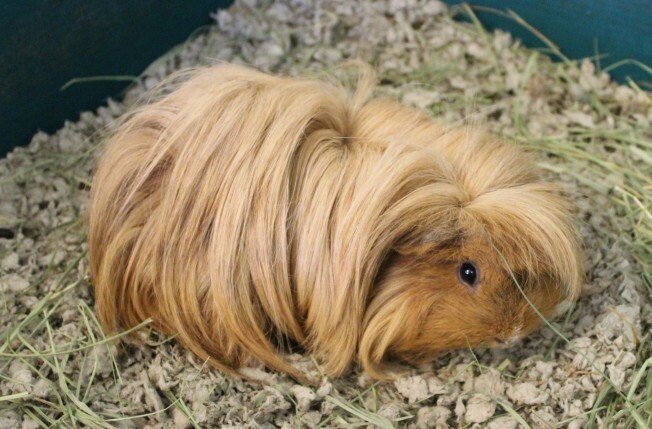 PHS/SPCA encourages potential adopters to visit their Tom and Annette Lantos Center for Compassion at 1450 Rollins Road in Burlingame to meet the guinea pigs. The shelter is open seven days a week for adoptions, Monday through Friday 11:00 am to 6:00 pm and weekends 11:00 am to 5:00 pm. People interested can call at 650-340-7022 for more information. In honor of Guinea Pig Appreciation Day, the Peninsula Humane Society & SPCA (PHS/SPCA) is waiving adoption fees on guinea pigs for the week of July 16-22. Guinea Pig Appreciation Day is celebrated throughout the world on July 16. Guinea pigs were once the most popular pets among royalty and the upper-class in Europe in the 16th century, and their popularity as pets has not waned through the centuries. PHS/SPCA encourages potential adopters to visit their Tom and Annette Lantos Center for Compassion to meet the guinea pigs. The shelter is open seven days a week for adoptions. Attached is a photo of Ladybug, an adult female guinea pig available for adoption.